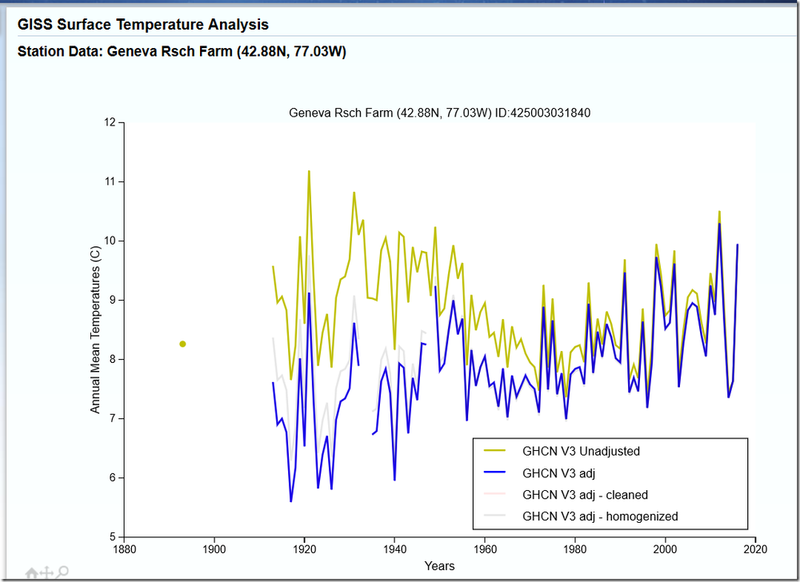 Regular readers here will recognize that the "Greatest Scientific Fraud Of All Time" is the world temperature data tampering fraud, by which the guardians of the world surface thermometer temperature records seek to convince you that dangerous global warming is occurring by making downward "adjustments" to earlier year temperatures and hoping you won't notice. To read Parts I to XVII of the series, go to this link, where you will find the prior 17 posts arranged in reverse chronological order. The monthly global land and ocean temperatures at the start of 2017 were extremely warm, with the first four months each ranking as the second warmest for their respective months, behind the record year 2016. Of particular note, the global land and ocean temperature for the month of March 2017 was 1.03°C (1.9°F) above the 20th century average—this marked the first time the monthly temperature departure from average surpasses 1.0°C (1.8°F) in the absence of an El Niño episode in the tropical Pacific Ocean. 2017 [was] the third-hottest on record. The only years to exceed it—2015 and 2016—occurred amid a powerful El Niño weather pattern that ripped heat from the Pacific Ocean into the atmosphere. In the absence of El Niño, the swelter of 2017 was unprecedented. Do you think, as I do, that when these people tell you something like "there was an absence of an El Niño in 2017," that you would be wise to check? Here is the NOAA page that records monthly what is called the "MEI": Multivariate ENSO Index. "ENSO" is the "El Niño Southern Oscillation." This is the most comprehensive measure of whether there is or is not an El Niño at a given point in time. Zero is neutral, and the index varies between about +3 (very strong El Niño) and -3 (very strong La Niña). The peak of the MEI in the very strong El Niño year of 2016 was +2.227 in January. In 2017, the MEI started out very slightly negative at -.055 in January through -.08 in March, and then suddenly had a powerful spike to +1.455 in May and +1.049 in June. Only after September did it turn modestly negative at -.449, reaching -.576 in December. Sure looks like 2017 was at least a modest El Niño year, although not as strong as 2016; an El Niño, but no record temperatures. Now let's look at the latest news on the subject of downward adjustment of early-year temperatures. Remember that the (highly accurate) satellite temperature records only extend back to 1979. When NOAA and NASA talk about "hottest year ever" they are referring not to these highly accurate records, but rather to records from a network of surface thermometers, extending back into the 1880s or so. But those are the records that they have been "adjusting" to make the past cooler, and thus make the recent temperatures appear to be warmer. Neither NOAA nor NASA has even provided sufficient information to enable outsiders to replicate what they are doing in "adjusting" the earlier temperatures downward. However, they have from time to time offered purported explanations. One of those explanations is that at certain stations they have changed the "time of observation," and therefore the earlier temperatures at these stations need to be adjusted so that they are comparable with more recent observations made at a different time of the day. It sounds plausible on its face -- but can they give us actual examples where the specific adjustment they have made can be justified? One of the diligent independent investigators who has called NOAA out on many previous occasions is Paul Homewood of the website Not a Lot of People Know That. Homewood has once again caught NOAA red-handed in a completely unjustifiable temperature adjustment, this time from Ithaca, New York -- home of Cornell University. What's more, the Ithaca records from 1949 to date specifically state that they are made at 8:00 AM. Thus, no possibility that the adjustments could be justified by change of time of observation. The 49.5 deg F for Ithaca for 1949 is way in the lower right. For 2016, NOAA's annual average temperature for the same Ithaca station read at the same time of day was 48.0 deg F. This is a link to NOAA's 2016 data. You'll have to scroll down a way to find Ithaca temperature data. But anyway, 48.0 deg F is a full 1.5 deg F lower than the 49.5 deg F of 1949. The temperature has gone down, not up -- at least if you compare the original readings for 1949 to the data currently reported for 2016. But what about the data for this area that make their way into the surface temperature records that support those "hottest year ever" claims that NOAA and NASA regularly release? Those data have of course been subject to large "adjustments." Here is a link to NOAA's "Climate at a Glance" information, with surface temperature data going from the late 1800s to 2017. They don't break these data down to an individual small town like Ithaca, but you can get the small region in which Ithaca is included, namely "New York State, CD10, Central Lakes," that is, the Finger Lakes region of upstate New York. And the answer is, for that small region, the 1949 annual average temperature was 48.6 deg F, and for 2016 it was 48.7 deg F. Instead of going down by 1.5 deg F, the temperature went up by 0.1 deg F! How could that possibly have happened? By the way, 1 deg C, or 1.8 deg F, is approximately the entire amount of the claimed warming of the past century that is regularly trotted out to support the narrative that "the earth is warming." Go through the prior seventeen posts in this series, and you will find dozens of other examples of downward adjustments of earlier year temperatures in approximately the same magnitude. No one who has looked into this can find any significant examples of adjustments going in the other direction. On average the mean temperatures in Jan 2014 were 2.7F less than in 1943. Yet, according to NOAA, the difference was only 0.9F. Somehow, NOAA has adjusted past temperatures down, relatively, by 1.8F. No one get any kind of satisfactory explanation out of NOAA or NASA as to what is going on. In Part II of this series back in July 2014, I reported on comparable early-year downward temperature adjustments discovered in the state of Texas by Homewood, in Kansas by Anthony Watts of the Watts Up With That website, and in Maine by Joseph D'Aleo of the ICECAP website. Those reports led Politifact to put some questions in writing to NOAA. They received a response, the gist of which was "our algorithm is working as designed" -- without any information as to how or why the specific adjustments were made, nor any access to code or methods to enable the adjustments to be replicated. At this point it is becoming an embarrassment to the Trump administration that they have not gotten anyone in place at NOAA or NASA who has started to get to the bottom of this.